In celebration of the year, FOPE is planning a dinner, actually a Fall Feast of local foods. The dinner will be held at the infamous Eaton Dining Hall (AKA Lobster Factory) in Pugwash on September 27th. In addition to an excellent and well known chef, Stephen Huston, Dr. Fraser Clark (Research Scientist at Dalhousie University) has agreed to speak. Invasion of the "green crab" is causing much concern in many areas of our country, and our waters are no exception. Considering the health of the River (and surrounding waters), we are making efforts to monitor and control this unwanted species. These efforts include donating the proceeds from this dinner to further research. Anyway, we hope you will be able to join us at dinner. Limited tickets are available so don't hesitate too long! Our Fall Feast happened on September 27th. It was a great success beginning with a full house, an amazingly warm autumn evening and a beautiful sunset over Pugwash Harbour. Cocktails and hors d'oeuvres (including freshly shucked oysters) served on the deck were followed by a meal prepared by Chef Stephen Huston. Everyone left happy and satisfied, so much so that we are now planning the next one – stay tuned! On August 28, FOPE feasted again. The second annual Fall Feast of Land and Sea was another sold-out dinner and another beautiful evening at the Lobster Factory. It started with Kelly shucking oysters and ended with Betty and Theresa’s pies. And the in between was delicious as well as Chef Stephen Huston with Wally Vater and Kim Atwell worked their usual magic. The speaker, Angela Bishop, let us know about the Community Foundation of Nova Scotia, particularly of interest to FOPE as we have just instituted the Alice M. Power Environmental Educational Fund. Peter Trenholm treated us to a medley of country tunes, and we all headed off into the night - happy again to have spent a wonderful evening with good friends. Thanks again to Stephen Huston and Kim for their annual donation of their superb cooking skills. The golf course dining room looked gorgeous after being set up by Bill, Mary, Jenn and golf club crew. Dennice and Faith did the flowers, and we were ready to party. Oysters anyone? Kelley Pye shucked and seemed to be stationed at the most popular place on the deck - well perhaps other than the bar. The scallops were a big hit too - a new idea this year for those who just can't cosy up to a raw oyster. Alice mc'ed; Wally and Lee cooked (first year for sturgeon); everyone ate, and it was time for dessert (all homemade - thank you, ladies!) and our speaker. Barry Rothfuss of the Atlantic Wildlife Institute outlined all the good work they are doing. Our entertainer was Chris Brown of Springhill who livened the place up with some music. We owe a lot of people thanks for this third annual event. First and foremost, thanks to John Mills and the members of the Northumberland Links Golf Club who closed their dining room and allowed us to use their wonderful facilities. And then there is the staff who were terrific and looked after every need. Wally, of course, and Lee who did the cooking, our speaker and our entertainer made the evening special. And to all of you who continue to support FOPE every year - we thank you! The fourth annual feast could not have been on a more beautiful day. John Caraberas’s music, not to mention Kelly Pye and her oysters, with the scallops and teriyaki chicken skewers, started things off. And then, there was the Silent Auction filled with goodies from all those people who so kindly donate and support us. Shane Robillard of Fox Harbour prepared a delicious dinner. Sheryl’s bakery finished the night. We have so many thank you's. First to the golf course and John Mills and Liz Roscoe for allowing us this venue. Then to Lynn, Catherine and Danielle for all their hard work. And don’t forget those people who were named on your menu card who donated food to the feast. The salmon, chicken, leeks, oysters and scallops were all from generous people. 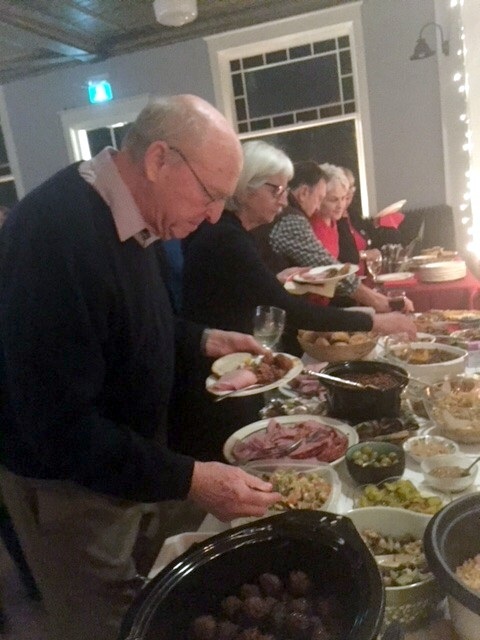 John and Bonnie opened up their beautiful hall for a wonderful Christmas party this year and many members of FOPE came to celebrate with us. We had way more food than we could eat and people also generously donated to the food bank. Thank you so much, John and Bonnie. Good party!